4-Day Painting the Portrait in Pastel Workshop with SBVA, Santa Barbara, CA. (Santa Barbara, CA) I will be teaching this 4-day workshop at Santa Barbara Visual Artists studio, Santa Barbara, CA. This workshop is designed to create a relaxed, informative, yet focused working environment for all skill levels. The core of the lesson will be based on drawing, values, edges, composition and creating life-like skin tone color. Students will focus on the fundamentals of drawing the human head while developing new skills in soft pastel. 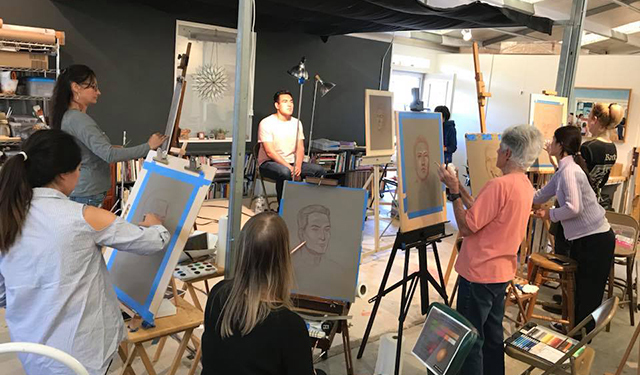 The workshop will feature a live model, and Cuong will demonstrate his own techniques to draw from life. Students will learn to use an approach that helps them see the big shapes first, and then go into details towards the end of the session. This is a great opportunity for you to discover your own passion for drawing, or just take your existing skills to the next level. This is a small class with indiviualized instruction, so space is limited. Contact Jan Baker's email: janbakerartist@gmail.com for information and registration.